Texas coach Charlie Strong told reporters on Saturday he has an idea who will start at quarterback in the season opener against Notre Dame. But he’s not telling. 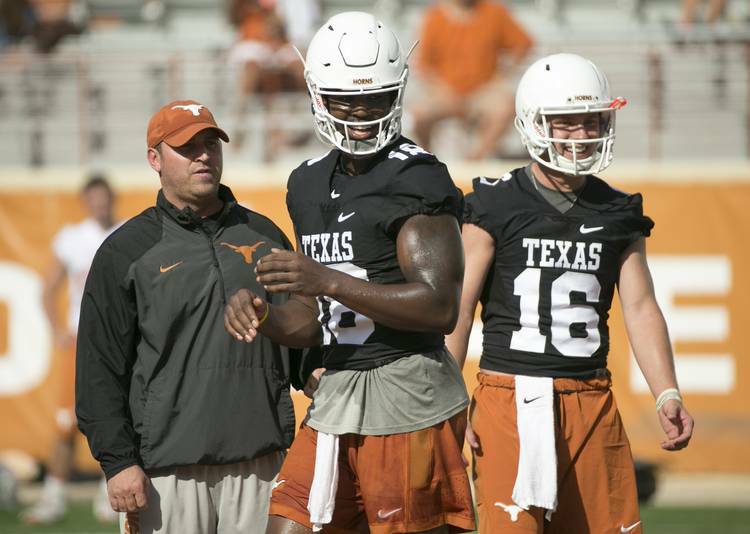 Strong has never denied that senior Tyrone Swoopes and freshmen Shane Buechele will both play against the Irish. He simply isn’t ready to say who will start or get the majority of playing time. Swoopes, who is 6-8 as a starter, found his niche last season in short-yardage situations with the “18-wheeler” package. The 6-foot-4 Swoopes relished taking shotgun snaps and running directly off tackle. He scored a team-high 12 rushing touchdowns. Buechele, the talented freshman from Arlington Lamar, enrolled in January specifically to compete for the starting job. Strong has praised Buechele at every turn and never once hinted that the right-hander couldn’t handle the job. Also on Saturday, Strong said there were no new notable injuries. The coach then rapped his knuckles on the table. Running backs D’Onta Foreman and Chris Warren III are back at practice. Jake McMillon is still filling in for injured center Zach Shackelford (ankle). But Strong seemed optimistic about getting right tackle Tristan Nickelson (ankle) back soon. Brandon Hodges and Denzel Okafor have been rotating in Nickelson’s place. Strong praised receiver Jerrod Heard, who caught a 50-yard touchdown pass during Saturday’s scrimmage. When asked about which players are flying under the radar, Strong mentioned Jake Oliver and Jacorey Warrick on offense and Poona Ford and Chris Nelson on defense. Next story: Which players are flying under the radar at Texas in August? Which players are flying under the radar at Texas in August?